Plan a week-end visit! Our location offers plenty of action for visitors of all ages and interests. Dundas Village is known for its specialty shops, quaint restaurants, and community events www.downtowndundas.ca. The village is a hotbed for artists of all mediums, especially potters! And there’s a spa on every block. Drop by our beloved Carnegie Gallery. www.carnegiegallery.org, a co-op gallery featuring the work of 100 local artists and artisans, all housed in the historic Old Library, right at the heart of the Village. 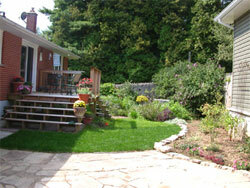 For overnight accommodation, we recommend Glenwood Bed and Breakfast, www.glenwoodbb.ca. This beautifully appointed historic home is an easy walk to our King Street business district. Another new addition is Osler House: www.oslerhouse.com. I have not visited this one myself but have heard great things! This is the nearest big hotel. Our visitors who stayed there said it was very nice. Award winning international/French Country menu with fresh local produce. Comfortable, warm, inviting, along with your basic pub food. Traditional tea room fare in a cozy setting. Save room for the bread pudding! Authentic Thai – you will not be disappointed. An authentic Indian restaurant – an easy favourite!